In central Vietnam lies a beautiful and ornate city named Hue. With its traditional Citadel comprised of beautiful architecture bathed in artistic craftsmanship, which is reflected in the Royal Tombs and Thien Mu Pagoda. But, there are also the modern-age ruins which offer an alternative to those which are encompassed by the city dripping in historical value. 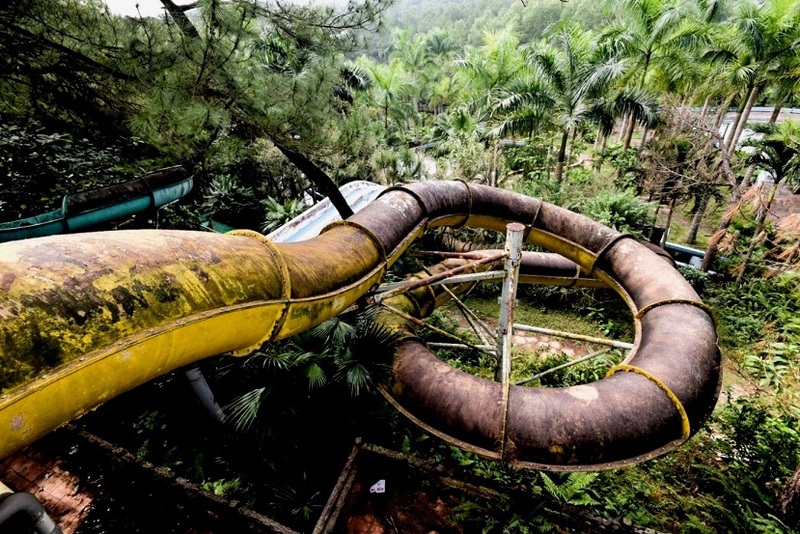 Welcome to a sight that looks like Post-apocalyptic Vietnam. I had heard rumors of a post-apocalyptic scene roughly 8 km outside of the city and after talking to my two traveling companions, decided it was worth the journey to see. 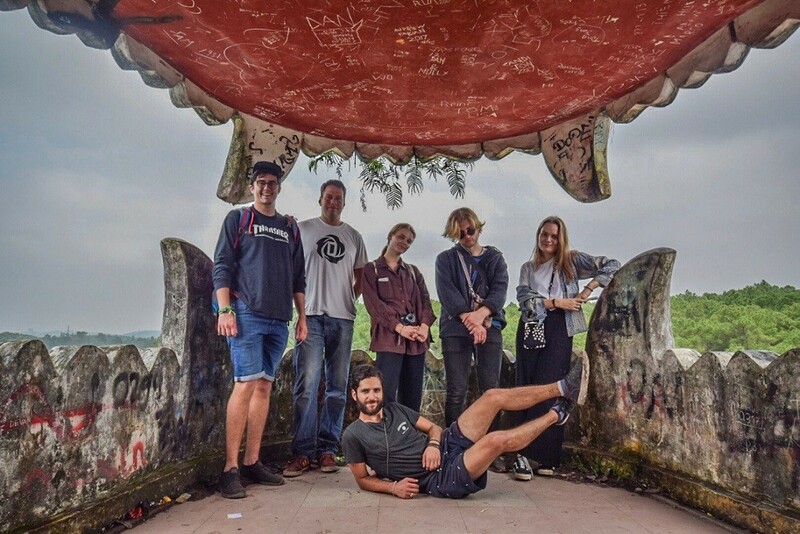 We put the idea to several people sharing our dorm in the tourist area of central Hue, and six of us mounted our motorbikes to begin our ride to the entrance of the park. 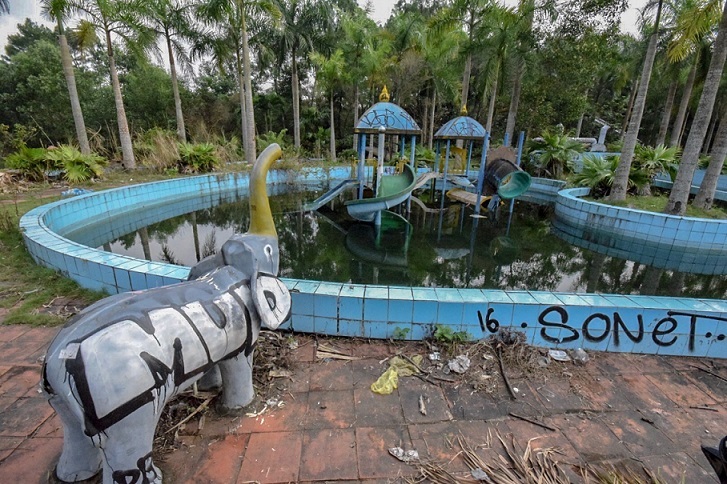 Upon researching the water-park I discovered it had closed down in 2004 for reasons unknown to me, and that there were tales of the aquarium tanks – still full of water – that still housed crocodiles left behind! The ride took around 20 minutes and our satnav escorted us to the entrance successfully. As we pulled up to the derelict gateway, a sign read Ho T uy T en after the letters a, h, and I decided to abandon the place similar to the customers and staff. At the gateway also sat a man on a plastic chair beside a barrier, charging entrance to the park albeit a clear illegitimate scheme. There is a way to gain entry to the park without the admission fee however. 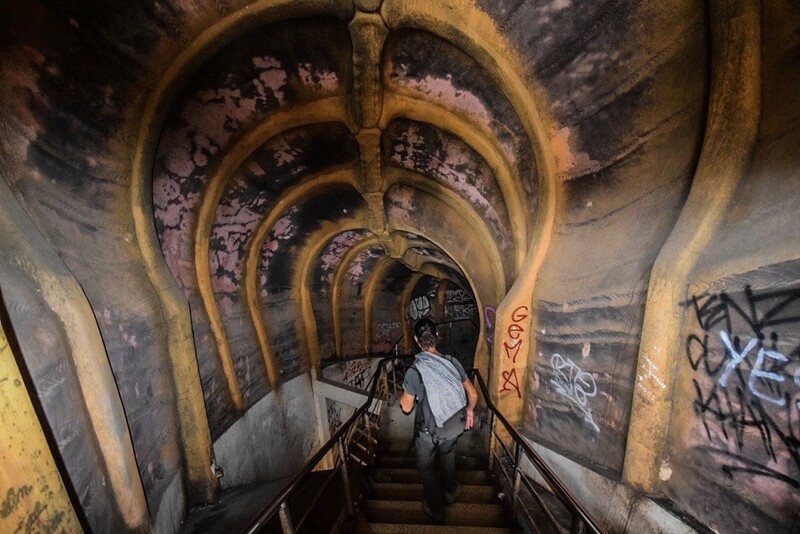 Keen to add a little extra excitement and exploration in to our adventure we decided to explore the surrounding roads to discover this somewhat secret passageway. We discovered that there is indeed an entrance through a field on the east-side of the lake. Accessible by way of turning right at the fork in the road (where the official entrance is down the road to the left), and then taking the first left. Maps say the road is a dead end, but in reality, the road gives way to a dirt track leading through field and into the park. There are no barriers, fences or signs to say you cannot do this (if you’re concerned). Descending a small hill onto the lakeside, we first discovered a small performance amphitheater with a pool inside – now green and dark with algae and vegetation. We spent some time here inspecting the rooms and seating areas. All the while being stared upon by the cows grazing outside the fenced arena. 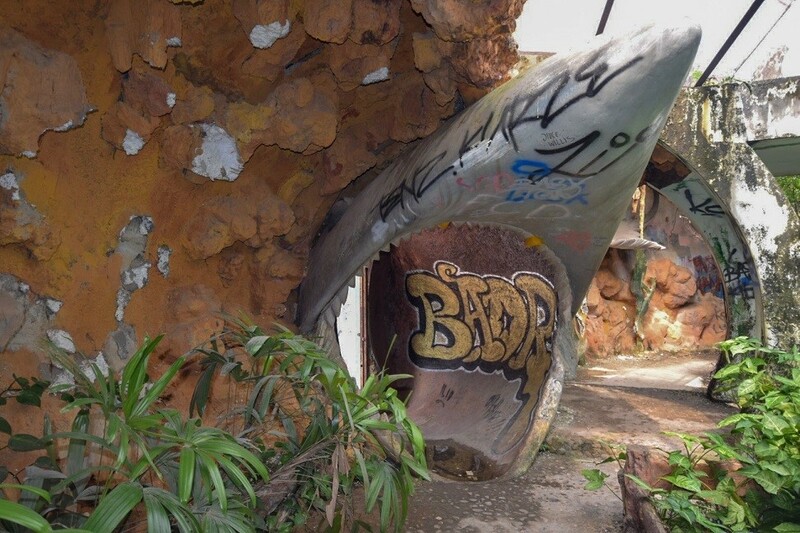 The structure had various rooms displaying a tonne of graffiti – some artistic, some not – and you can definitely tell where the kitchen used to be as well as the toilets – not such a pleasant discovery. The next structure which drew our attention was further around the lake, following the path on our bikes. We came across a small child’s area inclusive of a water-play-area along with slides, fountains (long since broken), and larger spiral slides which finished in a larger pool of dark green, stagnant water. Scaling the larger slides from the bottom to the top was pretty fun. 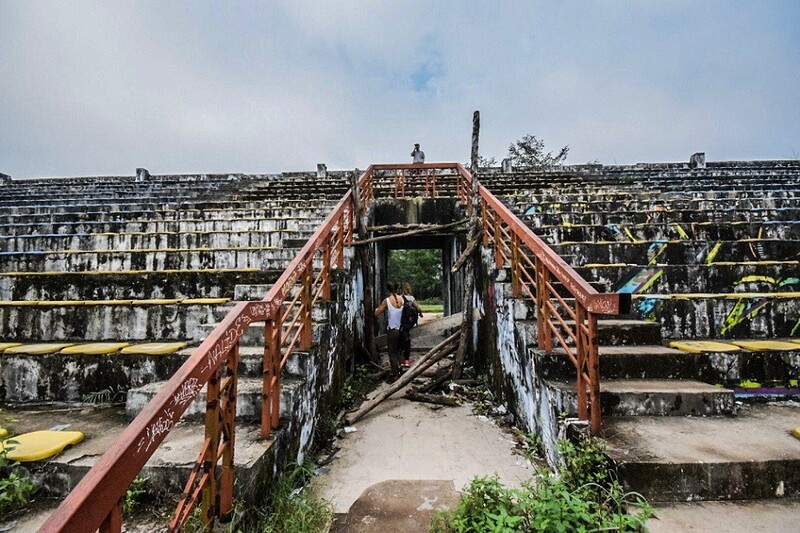 The view at the top certainly gives the impression of nature taking over what was once hers. 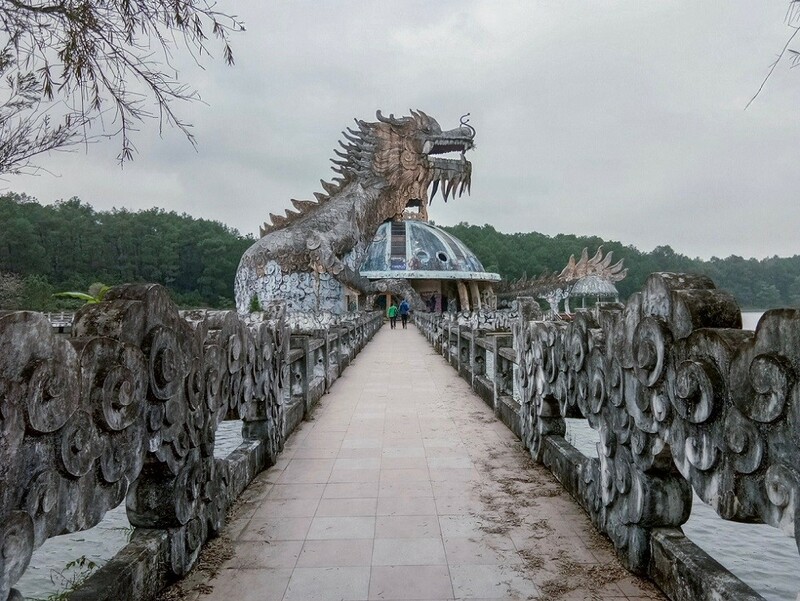 A short ride through the treeline then took us to the main attraction; a giant concrete building carved in the form of a dragon! Within the dragon sat a dark, damp aquarium littered with the shattered glass of the water tanks, used previously to house a variety of sea-life. This eerily quiet and unnerving place is the rumored home of the crocodiles (ill leave you to discover the truth for yourself), and as at this point I was alone – the others had progressed without me as I had ridden my bike around the dragon a few times – I decided I best catch up with the others. I found my friends at the top of a stairwell (designed to convey the inside of the dragons carkus) and looking out high above the lake as they stood within the mouth of the inanimate mythical beast. The view from here is spectacular and you can really spend some time taking it in. We made it in to the mouth of the beast! This little excursion for the day is definitely recommended as it gives a surreal feeling and a look into what the future our planet could look like. Providing great prompts for your imagination to run away with itself, as well as a sense of bewilderment and curiosity. The current lack of a crowd also makes you feel as if you could be amongst the first people to wander into this mysterious place, often only known through word of mouth. Jack Graves is a keen, enthusiastic traveler who enjoys discovering places and experiences a little different than the norm. He aims to provide entertaining and inspiring stories as well as informative advice in order to encourage people to take-on their own adventures which always encompass the experiences-of-a-lifetime.